Spain and England 'stuffed up' BIG TIME by failing to top their groups. 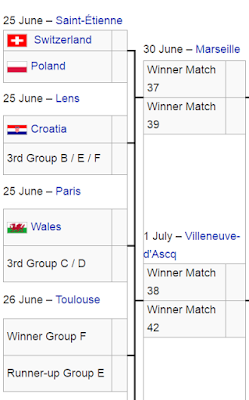 This, in turn, has caused the knockout stage draw to be RIDICULOUSLY bottom-heavy with all the traditional super powers of European football clustered together. If you're not a football fan and are wondering why I am making such a big deal about this, perhaps I could compare this to a tennis Grand Slam tourney draw, say the Australian Open or Wimbledon. It's almost like putting Djokovic, Nadal (at his peak), Federer, Murray, Wawrinka etc etc on one half of the draw, and letting everyone else have a 'free' (easier) ride on the other side of the draw. The big guns fight it out for one place in the final, and everyone else gets a shot at the other place in the final. Some fans are blaming all of this on the new 24-team format, but I think that's a bit unfair. The key reason for this anomaly is simply because two of the seeds (England and Spain) failed to live up to their ranking on paper. Certainly what is 'easier' is all relative. On one view, based on current tournament performance in the group stages, each team is receiving their just rewards. 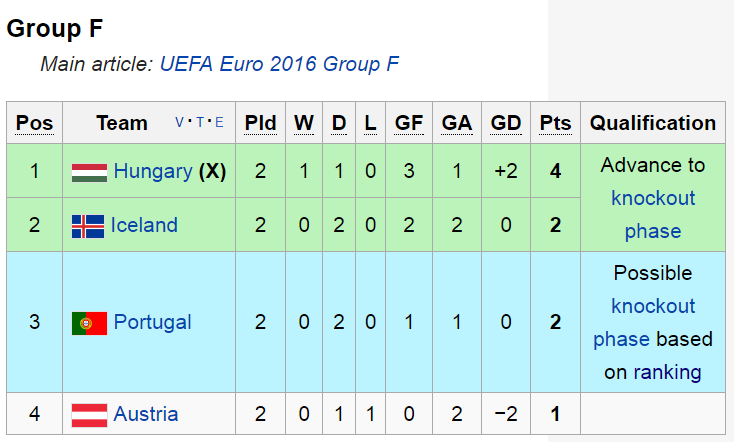 Croatia topped their group, and deserve an arguably weaker 3rd team outfit. 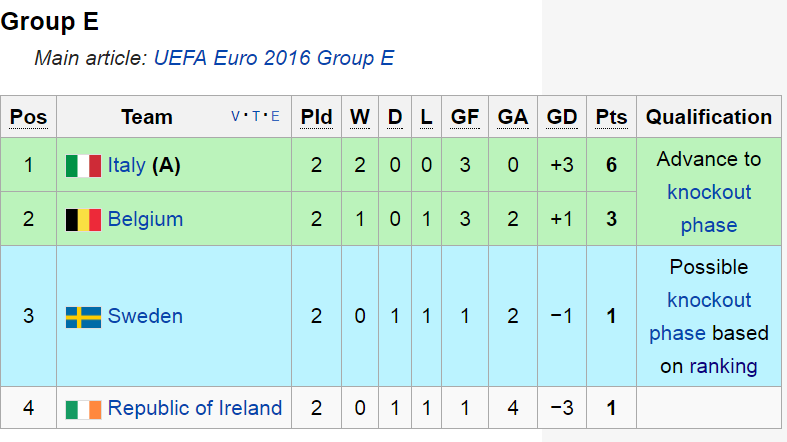 As do Wales who topped Group B. 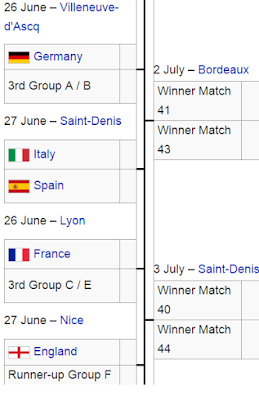 However, based on what everyone accepts to be the 'powers that be' in world football (which is either grounded in subjective perception or, more probably, the objective number of World Cup trophies and European Championships won), this is certainly a fascinating draw where all the titans have been forced into a corner so that they can all eliminate each other. France have 2 Euro titles and 1 World Cup title. It's madness I tell you. 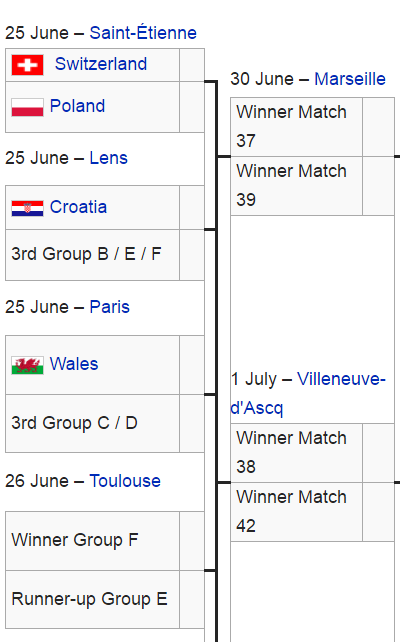 So on the above draw, there is certainly a case for a Croatia v France final. In any event I do hope that there is a brand new winner this year. 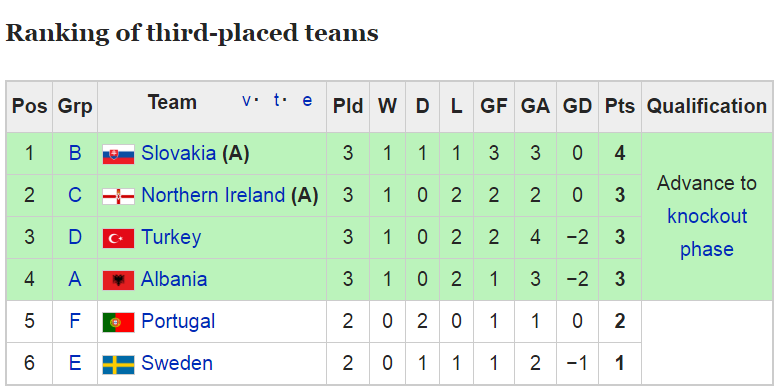 It seems likely that Portugal will top Group F or at least come third. 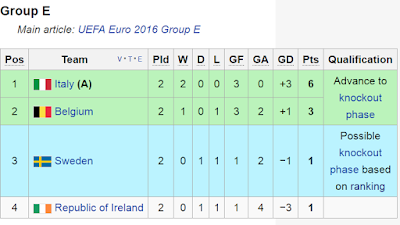 If they top Group F they will probably play Belgium. If they come third, they play Croatia. 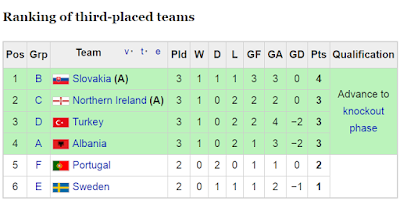 If Portugal come second, they play England. 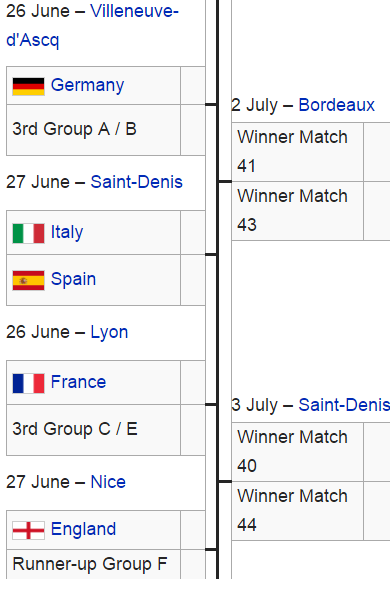 I really hope Portugal comes second, because that will make the knockout draw truly crazy. 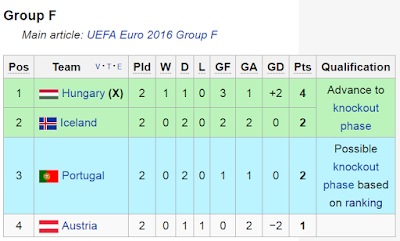 Portugal can come second if they beat Hungary and if Iceland beat Austria by the same or greater margin than that which Portugal used to beat Hungary. A very unlikely prospect. I think Albania are gone now, I really do --- because as much as I am hoping for a hot Hungarian salami upset, I don't think that will happen. But I would love to be proven wrong. I think Turkey are comfortably safe. It would take a Swedish 4-goal-margin victory or an Irish miracle (both certainly possible), coupled with Hungary's failure to win, to unseat them.